This is a guest post by Mike, aka The Dividend Guy. He authors The Dividend Guy Blog since 2010 and manages portfolios at Dividend Stocks Rock. He is a passionate dividend investor. I wanted to share these principles with you by giving you eight examples of companies that meet my investing criteria and should create a solid base for any dividend growth portfolio. Many investors give greater consideration to the actual company dividend yield or the payment in dollars they receive each month. I often read remarks from retirees telling me it’s easier for younger investors to focus on growth and that retirees don’t have time on their side and they can’t wait to see a dividend payment increase. My first investment principle goes against many income seeking investors’ rule: I try to avoid most companies with a dividend yield over 5%.The reason is simple; when a company pays a high dividend, it’s because the market thinks it's a risky investment… or that the company has nothing else but a constant cash flow to offer its investors. However, high yield hardly come with dividend growth and this is what I am seeking most. The fact is that almost all companies paying over 5% yield are not able to increase their payout each year. Their management eventually struggles to make their payment and there is an inevitable cut. In order to validate this point, I look at the dividend payment and compare it to the stock yield over the past 10 years. An increasing yield without an increasing dividend payment is a strong red flag as it tells you that the stock price is dropping. On the other hand, you want a company with strong dividend payment increases and a steady yield. This leads you directly to the jackpot: both capital and dividend growth! A great company meeting my first principle is Walt Disney (DIS). Back in 2010, the company paid a total of $0.40/share for a very low yield around 1%. Many income seeking investors are ignoring DIS for this reason. In 2016, the company is currently paying a 1.50% dividend yield. Here again, nothing to write home about. However, did you know that DIS pays over three and a half time its 2010 dividend payout? If you would have bought DIS in 2010 at $37, you would be yielding 3.80% on your investment. And I’m not counting the astonishing stock return. This has been possible because the company successfully manages its brand portfolio. ESPN has been the company’s most important growth vector over the past few years, but as it is currently cooling down, theme parks and movies divisions are picking up to keep the growth pace. My second investing principle relates to dividend growth as being the most important metric of all. It doesn’t only prove management’s trust in the company’s future but it is also a good sign of a sound business model. Over time, a dividend payment cannot be increased if the company is unable to increase its earnings. Steady earnings can’t be derived from anything else but increasing revenue. 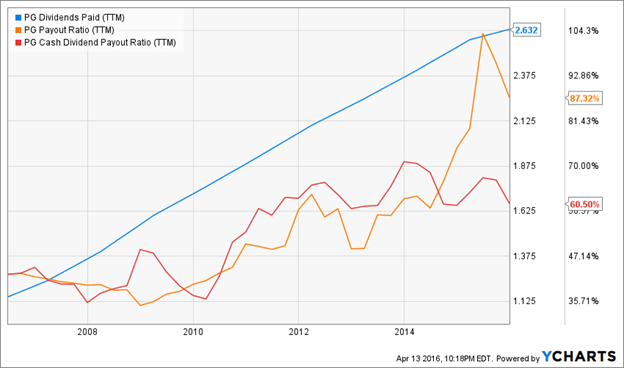 Who doesn’t want to own a company that shows rising revenues and earnings? A great company showing the perfect dividend growth profile is Genuine Parts (GPC). This company is part of the highly selective Dividend King group which includes only companies that has been consecutively increasing their dividend payment for at least 50 years. Through a great combination of organic growth and growth by acquisitions, GPC was able to extend its business year after year and rewarded their investors at the same time. The automobile parts industry is a repetitive business enabling consistent growth and GPC benefits from a great expertise in acquiring smaller competitors. This graph shows me how their dividend payments evolve over time compared to the company’s ability to pay them. The most important thing is to consider the cash payout ratio instead of the most known payout ratio. Because net earnings can be easily manipulated and cash flows are harder to manipulate, this ratio is useful to analyze cash flow being paid in dividends. Therefore, you can clearly see that even if Procter & Gamble posted lower earnings in the past couple years (leading to higher payout ratio), the cash dividend payout ratio has been relatively stable around 60% for the past four years. While looking at payout ratios will give you some hindsight about the future dividend growth of the company, metrics don’t tell you everything. Another way to validate if a company will be able to maintain its dividend growth rate is to analyze its business model. I often tend to look at companies that have a strong economic moat or that show hard-to-replicate competitive advantages. A good example meeting this investment principle is the asset manager BlackRock (BLK). BLK has the largest market share for assets under management (AUM) and is a leader with its iShares division. With over $1 trillion invested in its ETFs, Blackrock shows more than double the AUM of the second-place State Street Corp. (NYSE:STT). BlackRock offers a variety of products from fixed income to equities, therefore, when a mass of investors are leaving equities to move toward fixed income, BlackRock continues to sell them investment products. With new legislation coming from the Department of Labor (DOL), employers will have to offer low-fee investment solutions for retirement to their employees. Large asset firms such as BlackRock will benefit from these new rules. 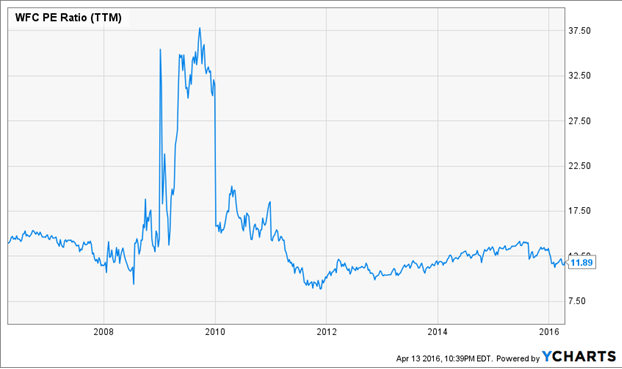 It currently tells me that the company hasn’t been valued at 12 PE since 2013. It could be a good indication that the stock price is attractive right now. However, it just gives me some hindsight, not a clear direction. By combining both methods, I can arrive at a consensus and determine if the company I’m looking to trade is at an interesting value. In this case, Wells Fargo seems definitely undervalued. I could even use a discount rate of 10% and the company would still look like a deal. I buy shares of a company when my investment thesis is strong and I sell them, when my investment thesis doesn’t fit anymore. I clearly define the reasons why I'm buying company X instead of buying Company Y or Z. An investment thesis is a combination of several good reasons why a company should post growth in the future. It usually starts with the definition of a strong economic moat (world class brand, patents, distribution network, R&D budget leaving competitors in the dust, high performing management team, new sector opening, product ecosystem or any other competitive advantage you can find). If my thesis is proven to be right over time, I simply keep the company and benefit from the true power of dividend growth investing: dividend growth rate compounding year after year. The stronger your investment thesis is, the better your chances of keeping your holdings forever and earn compounding dividend payments. If, by any means, my investment thesis is not valid at one point in time, there are no reasons for me to keep this company in my portfolio. This is why I sell my shares and move on. I simply review my holdings on a quarterly basis and trade accordingly. Selling a company according to the confirmation or not of your thesis shows the advantage of sometimes avoiding important value drops. Hasbro is a worldwide leader in children’s and family entertainment. It is mostly known for their numerous toy brands such as Playskool, Tonka, Milton Bradley and Parker Brothers. They are the 2nd largest toy company behind Mattel and have several trademarked franchises such as Transformers, Star Wars and Marvel action Heroes. What differentiates Hasbro is its great ability to produce licensed products. Their recent partnerships with Disney movies is pushing the company to new highs. Having both segments helps me to categorize my investments into a “conservative” or “core” section or into a “growth” section. I then know exactly what to expect from it; a steady dividend payment or higher fluctuations with great growth potential. A good example of a conservative holding would be 3M Co (MMM). 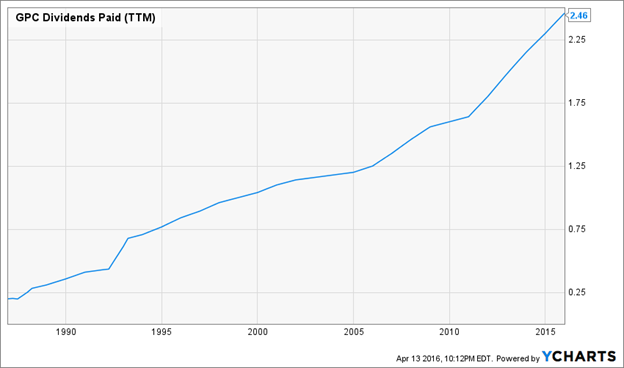 3M is a dividend behemoth showing 50% of their revenues in repetitive purchases. Their impressive R&D budget puts the company on the frontline of innovation. However, due to its important size and the fact that the company is already leading in many markets, growth perspectives can’t be astonishing. I like seeing MMM more like a bond increase its interest payment each year in my portfolio. It meets 2 dividend investing objectives: an increasing payout plus stability in any portfolio. A good example of a growth holding would be Chevron (CVX) at the moment. This company was added to my DSR Buy List in August 2015 as the company struggled (and still is struggling) with very low oil prices. While the company shows a strong dividend history, the fact the stock plummeted opens the door for additional growth perspectives. Since August 2015, the stock has caught up and shows a price return of +10% and pays a dividend of nearly 5% based on the cost of purchase. Obviously picking CVX in August was a riskier move, this is why it is part of the growth holding and not the core one. Do The 7 Investment Principles Work in the Real Life? I know it was a long article, but if you have made it so far, it’s probably because you somewhat wonder if my investment principles work in the real life. As I’m fairly transparent, I have shared my portfolios returns here. You will see how they perform very well since their inception. These investment principles have been based on academic studies (you can check them out here). But to be honest, I don’t think I am the owner of some kind of magic recipe. I just follow sound investing principles based on years of financial research. Do you own any of these companies? Disclaimer: We own shares of DIS, GPC, PG, BLK, WFC, HAS, MMM and CVX in our DSR Portfolios. Disclaimer: The opinions and the strategies of the author are not intended to ever be a recommendation to buy or sell a security. The strategy the author uses has worked for him and it is for you to decide if it could benefit your financial future. Please remember to do your own research and know your risk tolerance. DGI Disclosure: This article includes affiliate links. If you sign up for any products or services through them, I may receive a payment as a result.